Every three years Lutheran Church–Canada circuits elect representatives from across Canada to make decisions about the direction of LCC’s mission and ministry. 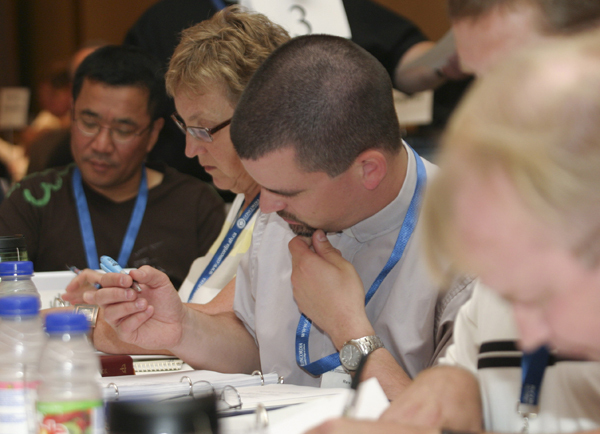 In 2011 the LCC Synodical Convention is scheduled for June 3-6 in Hamilton, Ontario. Delegates to the convention also elect a president, three vice-presidents and others who will serve in various roles for the next three or six years. These include members of LCC’s national governance body, the Board of Directors; the three Boards of Regents who give oversight to our seminaries and university college; the Commission on Theology and Church Relations which provides theological direction; and the Commission on Adjudication, the body charged with resolving disputes among church workers. In all, 18 positions on these boards and commissions need candidates in 2011. Members of LCC congregations can submit names of men and women whom they believe are qualified to stand for nomination. From this national list of names, Synod’s Nominations Committee will draw up slates of candidates to place before the convention for election. Most of these bodies meet two or three times a year and increasingly by telephone or Internet conference calls. If you, or someone you know has gifts, talents and skills which could benefit LCC’s mission and ministry at the national level, please submit a nomination form. The deadline for nominations is September 30, 2010.